Beat'em up, in which we travel through procedurally generated chambers and undergrounds, breaking through the ruins of a gloomy castle and gradually developing the hero who is being led to battle. All this can be done alone or in the company of other players. 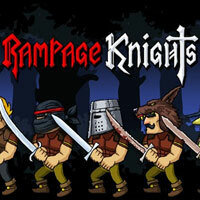 Rampage Knights is a beat up'em enriched with roguelike elements, developed by an independent team Rake in Grass. In Rampage Knights players assume the role of a wretch who has been imprisoned in a magical forest on the path to a ruined castle. The hero has no choice but to cross the thresholds of the fortress and face the dangers lurking there, i.e. all kinds of creatures like goblins, animated skeletons, demons, ghosts and vampires, and even dragons. In Rampage Knights players observe the action from the side perspective. Before starting the game players choose the profession of the protagonist and one of the available skins. The struggle itself is about traversing procedurally generated chambers and dungeons and eliminating everything that stands in our way; the combat system might remind the one featured in the iconic Golden Axe. During the course of the game players not only broaden the range of available classes but also increase the combat potential of their character's charges gaining new skills, spells, and increasingly more powerful equipment. It's worth keeping an eye on it because the game features the permadeath mechanism - it means that after the hero's death there's nothing else left to do but to start the adventure from scratch. Rampage Knights does provide a solo mode but the game spreads its wings while playing with other players via either online or local cooperation mode. Rampage Knights has 2.5D visuals, maintained in cartoon style.